We built our “world’s best” reputation on these bold and complex cheddar cheeses. Melt into grilled cheese, sprinkle over casseroles and enchiladas—or simply slice and serve. 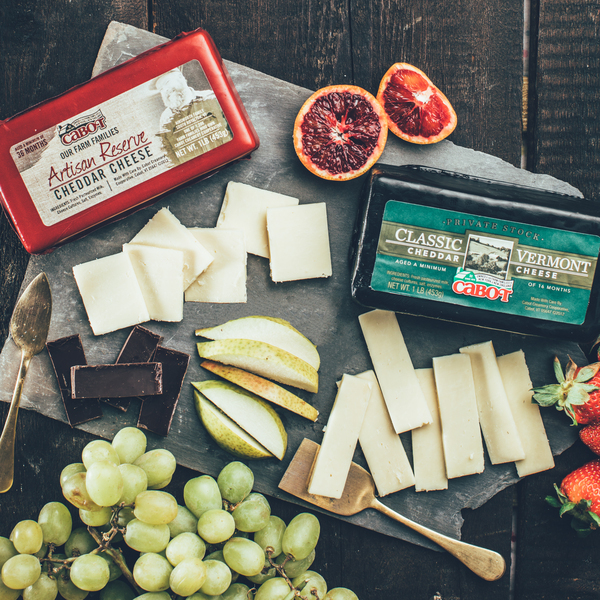 Add a kick to any meal with Cabot’s full range of flavored cheddar cheeses. From Horseradish to Hot Habanero, they blend and melt just like the classics—but with an extra jolt of flavor. The best of our best: these four super-premium aged cheddars honor and celebrate Cabot’s cheesemaking legacy in the most mouthwatering way imaginable. While our award-winning cheddars often claim the spotlight, we produce some beautifully creamy, buttery non-cheddar cheeses that deserve your attention. Now that you can find six of our world-class cheeses in ready-to-serve Cracker Cut Slices, preparing party platters and picnic lunches is super-easy, and deeply delicious. Our award-winning light cheddar cheeses bring the big bright Cabot flavor you crave. The only thing missing? A whole lot of calories and fat. A hand-selected collection of Cabot’s finest cheeses that have been aged to perfection. All of the taste, none of the fuss. 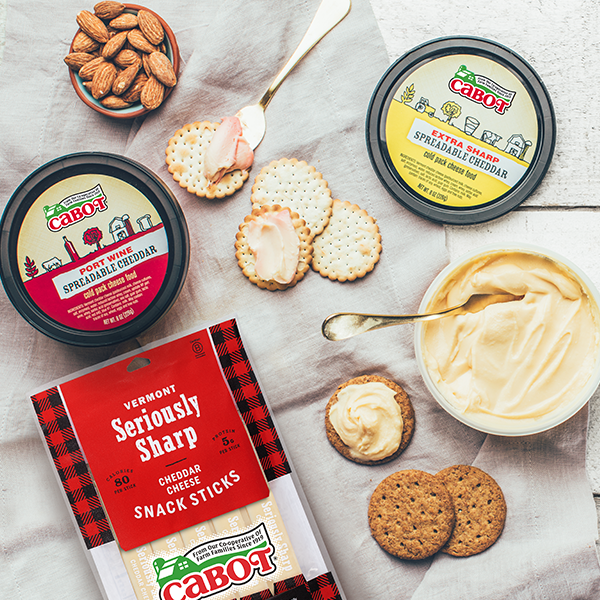 Our spreadable and powdered cheddar cheeses and bite-size snack bars make it even easier to enjoy our award-winning cheese. 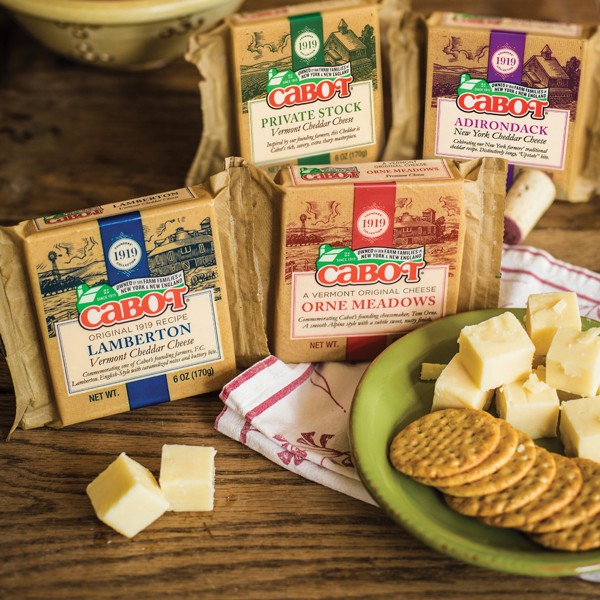 Featuring original recipes dating back to 1919, these distinctive cheddars tip a hat to the farmers and cheesemakers who founded Cabot nearly a century ago. Our cheeses have won every major award for taste, which tells us that we must be doing something right. But as much as we love and appreciate all the recognition, that’s not what gets us up before dawn every morning. Our 1,000 farm families love the land, we love our cows, and we love the work. This is the only way of life we know, and we wouldn’t trade it for anything. We’re proud to make the best cheese and dairy products in the world for you. Our award-winning cheddars are lactose-free. It’s true. We promise! All our cheddars are aged—a process that not only packs in bold taste, but naturally removes lactose. Are you surprised? So are a lot of our customers. Learn more here. Cheddar is also a great way to sneak some bone-strengthening calcium into your diet. In fact, dairy foods naturally contain protein, riboflavin, and phosphorus. So, go ahead, add a little extra cheddar to your life. Your body (and your taste buds) will thank you. And, here’s some tasty cheese nutrition that surprised even us: According to a study published in General Dentistry, eating cheese may help protect teeth against cavities. Here’s how: Cheeses raise the pH level in your mouth, making it more alkaline and better at neutralizing the plaque acid that leads to tooth decay. We love having even more reasons to eat cheese, but we still recommend brushing your pearly whites twice a day.